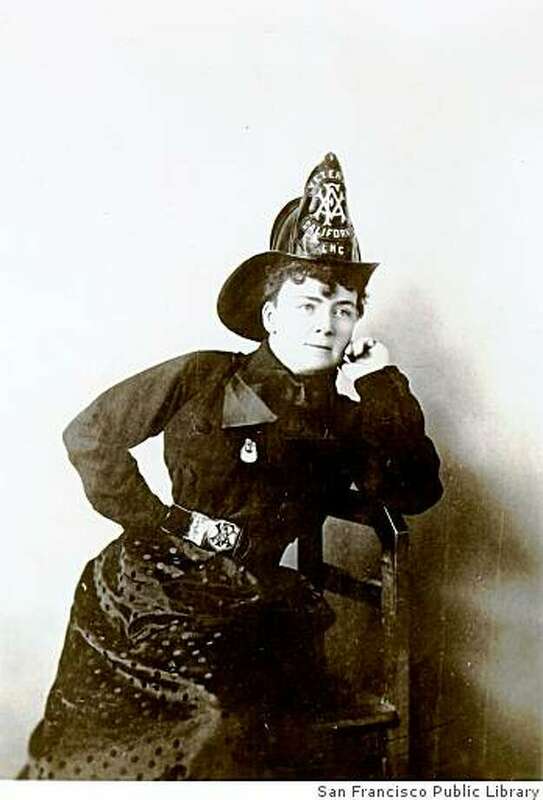 One of San Francisco’s best known historical figures, Lillie Hitchcock Coit, is permanently associated with Coit Tower, whose construction her estate funded, and with San Francisco’s early volunteer fire brigade, which she championed. In 1851, seven year old Lillie Hitchcock and her wealthy parents moved from Kentucky to California . Young Lillie was deeply and personally affected by a series of fires, one of which nearly claimed her life. Soon after arriving in San Francisco, Lillie watched two of her friends burn to death when a building they were playing in suddenly caught fire. Lillie was rescued from the flames by John Boynton, a volunteer member of Knickerbocker Engine Company Number 5. Boynton chopped a hole in the roof of the building, let himself down on a rope, put Lillie on his back, and climbed to safety. Lillie immediately and permanently became a friend and vocal supporter of the firefighters of Knickerbocker Engine Co. No. 5. In October 1863, she was made an honorary member of the engine company, given her own badge and fire helmet, and held a prominent place in festivities and parades celebrating the city’s firefighters. Victor Arnautoff’s Coit Tower mural “City Life” includes a fire truck with a prominent number 5, likely intended as an homage to Lillie’s connection to Knickerbocker Engine Co. No. 5. Lillie was considered colorful and eccentric - gambling, smoking cigars, and wearing trousers before it was socially acceptable for women to do so. She married wealthy businessman Howard Coit in 1863 and was widowed upon his death in 1885. Lillie’s bequest paid for both the construction of Coit Tower and for a sculpture placed in nearby Washington Square Park to commemorate San Francisco’s volunteer firefighters. The sculpture, by Haig Patigian, depicts three volunteer firefighters at work. One of them is carrying a distressed young girl to safety. Masha Zakheim, "Coit Tower San Francisco - Its History and Art", p. 7; Holdredge, p. 295.